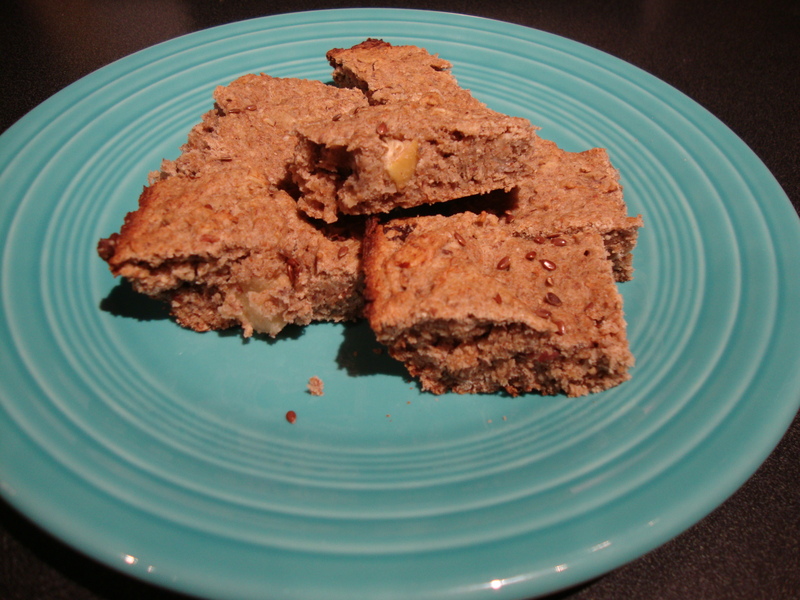 A good friend of mine said she wanted to make some healthy, no sugar breakfast bars. M came over and got to work, basing them on a recipe she found on line. I did little, other than flour the pan, sprinkle a few flax seeds and offer my 2 cents from time to time. Though they didn’t turn out as granola-bar-like as we thought, and a little more muffiny, they taste really good! They’re pretty dense, but full of all kinds of good things. I’ll post the recipe we based it off of and you can doctor it up your own way like we did. Among our changes: we used less than the called for butter and added a few Tablespoons of natural peanut butter, we added about 1/4 c. ground flax seeds/flax meal and sprinkled some whole flax seeds on top. She used honey instead of so much sugar, diced apples, sliced almonds and a little water to thin it out as necessary (it occurred to me this morning when I opened my refrigerator — we should have used almond milk!) Als0 — keep an eye on the time. We cooked for about half as long and it was perfect! I think it was an amazing first attempt and I’ll definitely make these (or something like it) again. Also, though it didn’t look like it would, it nicely filled the bottom of a 9×13 pan and left us with 2-3 dozen small bars. 1. Preheat oven to 425 F. Grease and flour 13×9 inch baking pan. 2. Sift together: flour, salt, soda and spices, set aside. 3. In large bowl, beat until light and fluffy: butter, sugar, egg. Add bananas and vanilla beat until smooth. 5. Stir in nuts etc. Bake until golden (about 25 minutes) — keep an eye on it! We only baked about 10-12 minutes and it was starting to brown and cooked perfectly! Beware! Entry filed under: Bread & Baked Goods, Breakfast, Recipes, Uncategorized. Tags: breakfast, breakfast bars, flax, granola bar, oatmeal.